Local government began in 1879 with the formation of the Caboolture Divisional Board with authority over the present Caboolture, Kilcoy, Landsborough, Pine Rivers, Redcliffe and part of Maroochy shires. In 1888 the southern areas, Pine Rivers and Redcliffe were made Divisions in their own right and in 1890 the coastal Maroochy Division was created. 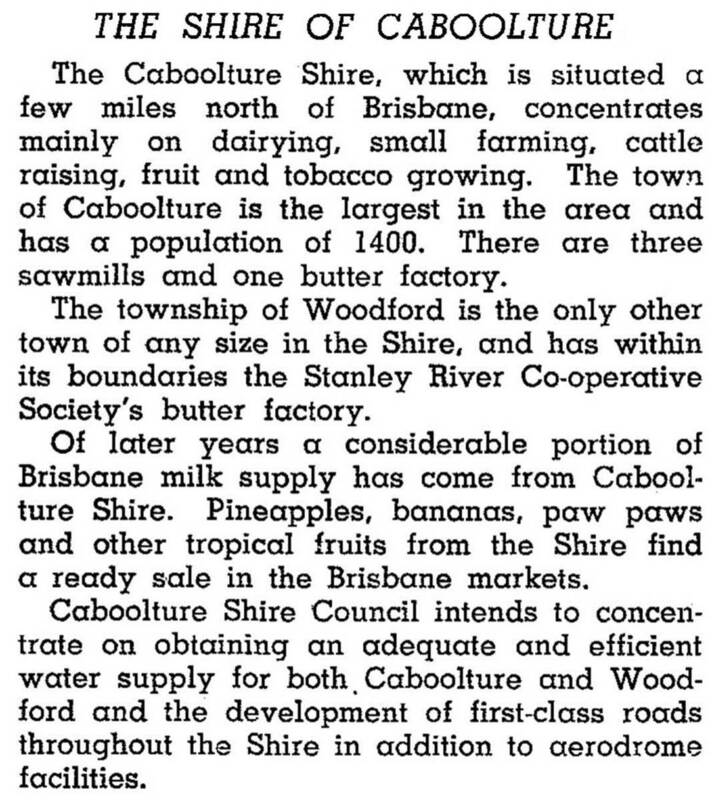 The remaining sectors, Caboolture, Kilcoy and Landsborough constituted the Caboolture Division, which became a shire in 1903. Despite the shire's size there were few sizable towns. The few important ones (with their census populations in 1911) were Caboolture (764), Kilcoy (715), Landsborough (177), Maleny (510) and Woodford (488). Caloundra scarcely existed, its first general store opening in 1912. In that year the shires of Kilcoy and Landsborough were formed by severance from Caboolture, reducing its area from 1165 to 495 sq miles, or 1225 sq km in 2008. Prior to the severances, Caboolture Shire's population was 3219 males and 2540 females (1911) census. In the late 1950s, the rail link and access to the Bruce Highway began the Shire's urbanisation. Burpengary, Deception Bay and Caboolture itself became outer suburbs of Brisbane; Caboolture Shire's population in 1991 was over 70,000. Bribie Island, a part of the shire and across Pumicestone Channel from Toorbul, had about 9000 people in 1991 and 14,500 in 2001. In 2008 Caboolture Shire was amalgamated with Pine Rivers Shire and Redcliffe City to form Moreton Bay Regional Council. * Before severance of Kilcoy and Landsborough.